For many Christian leaders, the experience of ministry includes enough conflict and disappointment to soon wear off the patina of one's initial enthusiasm. And yet relief and renewal seems too often out of reach. What happens in this season of ministry is more than a matter of whether or not a Christian leader can persist. It is, in fact, possible for a person to engage the call to maturity at the juncture of discipleship and leadership. Enduring Ministry is designed for those who seek this more durable way forward, one that is infused with grace and inspired by good mission. In Enduring Ministry, Samuel Rahberg draws on insights from the monastic tradition, the ministry of spiritual direction, and the practice of Christian leadership to support and empower women and men for continued ministries in the church, helping them turn from merely enduring to lasting, effective, and vibrant Christian leadership. Samuel D. Rahberg is a spiritual director with experience in parish education and administration. He is an oblate of St. Benedict and serves as the director of the Benedictine Center of St. Paul's Monastery in St. Paul, Minnesota. Learn more at www.samuelrahberg.com. Ministry can be exhilarating, beautiful, and life-fulfilling. But it can also be heartbreaking and exhausting, and it demands from the best of us a stamina and resilience we often struggle to maintain. I'm so grateful for Sam Rahberg's gracious, practical and deeply honest book which offers an elegant, humane and sustainable approach to the challenge of lifelong vocation. If someone had put a copy of Enduring Ministry in my hands twenty years ago my ministry would have looked very different. I wish they had. Gracefully blending leadership and ministerial experience, spiritual direction, and the fruits of being attentive to one's own growth and spiritual journey, Rahberg's Enduring Ministry is a valuable resource for any "who wish to live faithfully and well towards a ministry that endures." This book will have broad appeal not only to those in active Christian ministry, but also all who work with or accompany those called to this service. Anyone who has struggled at times to remain faithful to or energized by their call to serve others will find in Rahberg a wise and understanding companion willing to share his own challenges in finding life and joy through continuing commitment to an enduring ministry of Christian service." Here at the intersection of truth-telling, the ministerial life, tradition, and a naive response to the vocational call, this book incorporates the complexity and challenges that church leaders face. Drawing on the Benedictine charisms, these chapters offer the gift of new perspectives to the rigors of a ministerial life and the means to cultivate the seeds of hope that might keep one from disappearing from the ranks of Church leadership. Invitingly authentic. The leader is immediately invited into a reflective process through imagery, Scripture, poetry and story as Sam's authentic and wise voice is experienced in his writing. The realities of Christian public leadership are explored through discerning questions and practices, which invite the readers to listen to their hearts and minds as they faithfully reflect on how they lead. The shifting landscape has never been more challenging for Christian leaders. As such, for those of us called to this ministry, it is critical that we are intentional about being soulfully grounded. Sam Rahberg's Enduring Ministry provides an elegant and thought-provoking invitation to go deeper into who God is calling us to be. This is a resource I will not only continue to use for personal reflection, but will widely share with those I am called to walk with as they discern and form how to use their gifts for God's mission. Ministry with an open spirit to imagine and create new initiatives is at the very heart of Sam Rahberg's life. Enduring Ministry is both a resource book with chapters of every day experiences that address real life questions and a reflection book that encourages integrating personal experiences with one's inner spiritual journey. It is poetic in its imagery as well as straight forward in its challenge to honestly be attentive to one's limitations and one's God-given strengths. Enduring Ministry: Toward a Lifetime of Christian Leadership is Sam's story. The questions he poses at the end of each chapter gives readers a gentle nudge to share their own story. In Enduring Ministry, Samuel Rahberg claims that ministry endures when it is grounded in lived experience and enriched by God's Word, theological wisdom, and institutional commitments. What he offers is a perspective that helps us navigate the risks and rewards of one's life calling in a spirit of reflective fidelity. 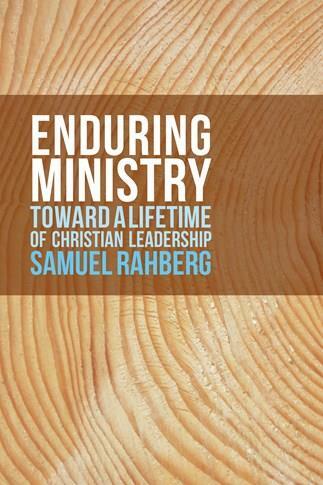 Sam Rahberg's Enduring Ministry offers a guide for discerning your transitions. He's a practitioner that has been seasoned through experience and tradition. This book is bold and brave. For a long, lingering, look at the "worth it" of ministry this book is timely and true to today's changing culture of Church. Rahberg is a gracious teacher, sharing his wisdom from years of practice, listening, and prayer. If you are standing on the edge and need to recover your balance or ready to take your ministry to a new place, Enduring Ministry invites leaders to listen and keep learning.